DOM.BG Review 2019: Is DOM.BG a Good Hosting? DOM.BG is a Bulgarian web hosting company with servers in Bulgaria, the U.S., and Canada. In business since 2002, this vendor provides basic shared hosting plans for personal and business users. Since 2002, Bulgarian web hosting provider DOM.BG has been serving clients with basic hosting plans at reasonable prices from its servers in Bulgaria, the U.S., and Canada. To date, this vendor has registered more than 170,000 domains. Its difficult-to-decipher website is in Bulgarian. DOM.BG’s minimal feature set should satisfy the basic requirements of hosting customers with simple needs. The basic shared plans include 1,000 MB of disk space and 5 GB of traffic bandwidth, and the pro plans increase this amount to 10,000 MB of disk space and 50 GB of traffic. If only it were that simple. This vendor also advertises that there is “no physical limit for disk space,” but goes on to say that large files can temporarily be stored providing you stay within the plan limits “most of the time,” otherwise you run the risk of being bumped up to the next hosting plan. Upgrading to the pro plan provides you with an SSL certificate, but you can also purchase SSL certificates for other plans, including ones signed by GeoTrust or Equifax. Besides the pay-for plans, DOM.BG also offers free web hosting plans. You get a free month of hosting with a paid domain registration, which comes with email redirection and DNS servers for a month. I tried to get more information about the free hosting options, but customer service did not respond to my request. DOM.BG’s plans are priced quite low, and for a monthly price equivalent to a cup of coffee, you can get hosting equivalent to that offered by some of the biggest hosting companies in Europe. Just don’t expect SSD storage or even attentive customer service at these prices! You can pay for hosting plans on a monthly, yearly, or multi-year basis. If you want to test DOM.BG’s services before making a commitment, you might take advantage of their offer that gives you a month’s worth of free hosting for every domain you register with them. As I’ve already hinted, I found this company’s customer service to be somewhat lacking. My attempt to get some general sales information was met with an automated response informing me that my request would be handled sometime in the future. It never was. You can also summon customer support by email and telephone. 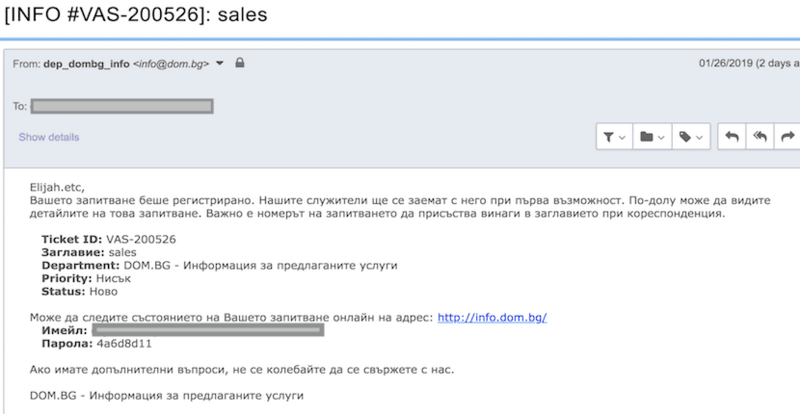 DOM.BG is a Bulgarian web host with servers in Bulgaria and North America. Its hosting options are somewhat limited and are difficult to decipher from the dated website. Customer service could certainly be better, but you might find something useful here if you’re looking for simple Bulgarian hosting. Wondering how DOM.BG stacks up against other Web Hosting companies? Enter any other Web Hosting company and we will give you a side-by-side comparison.